None of these cold desserts really appealed to me, however, and neither did the few recipes I saw for pineapple pudding and pie. What I really wanted was pineapple cake — I had fond memories of a pineapple upside-down cake that a great aunt used to make. I thought I might find its progenitor in 19th-century American cookbooks. But I learned there were almost no pineapple cakes back then, and nothing like the pineapple upside-down cake. It turns out that this cake wasn’t made, so far as we know, until the 1920s. But the concept of upside-down cake is nothing new. As early as the Middle Ages, Europeans made some cakes by topping batter with fruit — usually apples or dried fruit — and cooking it over a fire (or baking it), then flipping it over for serving. In America, these were called “skillet cakes.” A similar French dish was the apple tarte Tatin, created in the 1880s. According to Gil Marks, who wrote about pineapple cake for Tori Avey, the first-known use of the term “upside-down cake” was in 1923, for a cake made with dried plums. The name was probably derived from “upside-down pies,” which appeared in the previous decade. 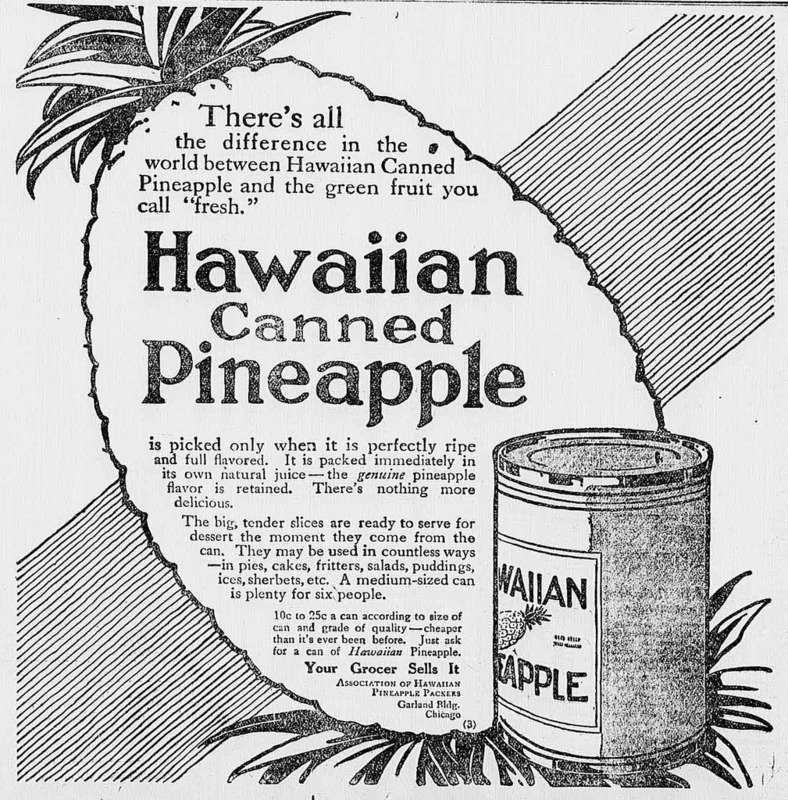 Then in 1925, the Dole company sponsored a recipe contest for the best dish using pineapple, and ran ads for it in women’s magazines. The winner was a pineapple upside-down cake from Mrs. Robert Davis of Norfolk, Virginia. 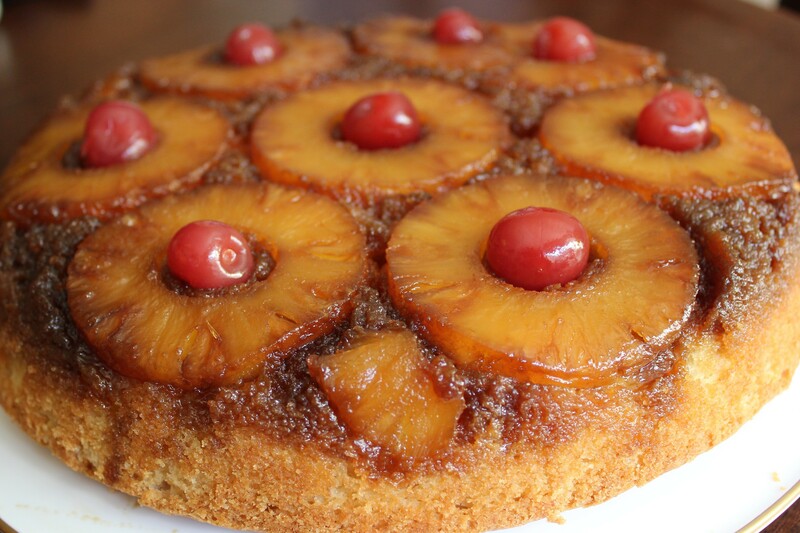 Dole received more than 2,500 submissions for pineapple upside-down cake (out of 60,000 recipes total), so clearly some people were making a version of this cake prior to 1925. In any case, the Dole company promoted Mrs. Davis’s winning recipe widely, and soon pineapple upside-down cake was one of the most popular cakes in North America. I found the original winning recipe online and baked it recently, and my family devoured it. It was, after all, judged the best of 2,500 pineapple upside-down cakes! It has a light, fluffy crumb, and nicely caramelized fruit. And it’s very easy. You can use fresh pineapple instead of canned, and I’m sure it will taste even better, but ironically, it won’t be as authentic. You can also use drained crushed pineapple, as mentioned in the original recipe, but I don’t think it will look as nice. Maraschino cherries had become wildly popular in the United States in the early 1900s, which could explain why they were chosen as a garnish for this cake. Artificially dyed cherries were likely used on the 1920s cakes, but I opted for dye-free cherries, which are still bright and festive. Also, the original recipe suggests spreading whipped cream over the top of the cake if desired, but I think that would ruin the cake’s pretty top. Plus it’s superfluous — this cake is rich and delectable on its own. 1. Preheat the oven to 350°F. Lightly grease a 9-inch cast-iron skillet. (You can also use a 9″ X 9″ X 2″ baking pan, but in Step 4, melt the butter before placing in pan.) Sift together the flour, baking powder, and salt, and whisk well. 2. Beat the egg yolks briefly, then beat the egg whites separately, until very frothy. 3. Cream 1/2 cup butter, then gradually add the white sugar, beating for about two minutes. Add the yolks to the creamed mixture and mix well. Then add the milk alternately with the flour, in about three installments, mixing well after each addition. Last, fold the beaten whites and vanilla into the mixture. Set aside. 4. Melt the remaining two tablespoons butter in the skillet. Spread the brown sugar evenly over the butter. Place pineapple rings on top, as close together as possible (you’ll have a few slices left over). Pour the cake batter over the fruit, distributing evenly. 8. Bake for 45 minutes, or until a toothpick inserted in the center of cake comes out clean. Immediately after removing from oven, run a knife around the edge of the cake, then carefully turn cake upside-down on a serving dish. Garnish with maraschino cherries. Serve warm or at room temperature. This cake is best the day it is made. This entry was posted in cake, dessert and tagged baking, Cake, food, food history, James Drummond Dole, maraschino cherries, Mother's Day, pineapple, tarte Tatin, upside-down cake by revolutionarypie. Bookmark the permalink. Maybe I’ll open a mail-order pineapple cake business! Though as I mentioned, it didn’t really age well. Interesting culinary history, as always. 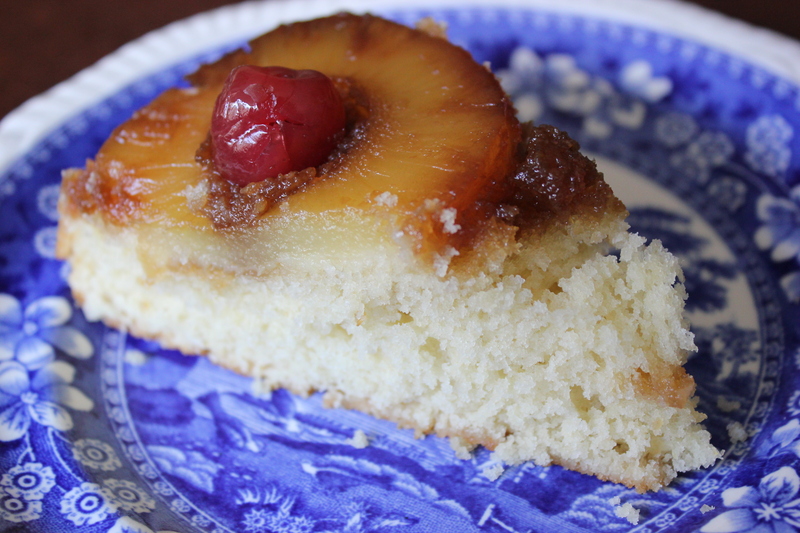 I’ve always loved pineapple upside down cake and it is good to know the story behind it! Do you know when the pineapple became the symbol for hospitality? It’s represented all over the place in colonial America, but I seem to recall it appearing as a symbol around the same time here in Britain. Hi Debi. I’ve read that colonial American sea captains speared pineapples on their gates when they returned from a journey, to signal their safe return. I wonder if they got the idea from the Caribs, who hung pineapples over their doors. Anyway, the fruit came to symbolize hospitality in America because it was impressive for a host to serve his guests such expensive fruit. I’m not sure when, exactly, this symbolism took hold but I guess its roots are in the 17th century. I think the symbolism in Europe developed around the same time but was slightly different — more the idea of royal privilege. There is a great portrait of Charles II receiving a pineapple from his royal gardener (c. 1675). I did not know that Dole pineapple started so long ago. Great info! Thank you! What a delicious post! Having grown up near the pineapple fields on Oahu, it was fun reading all about Dole and this prize winning recipe. I remember my aunt used to make a pineapple upside down cake using canned pineapples but I’m not sure if this was the recipe she used. It was yummy in any case. I can’t believe people used to rent pineapples for centerpieces! That’s very interesting. I knew they were expensive back in Washington’s time, but renting them is something else. Fresh pineapple does seem to vary a lot in sweetness. Funny about the Hawaiians’ versus tourists’ preferences! And I didn’t realize before writing about this that pineapple wasn’t even native to Hawaii. Interesting post about how upside-down cake didn’t become popular until canned pineapples put the fruit into the cupboards of ordinary Americans. The history of the pineapple has a darker side, as this quote from a Boston Globe story attests. http://www.boston.com/bostonglobe/ideas/articles/2010/09/26/new_englands_hidden_history/?page=1 attests. C.S. Manegold, author of the new book “Ten Hills Farm: The Forgotten History of Slavery in the North” notes that slavery’s markers aren’t hidden or buried. In New England, one need look no further than a symbol that graces welcome mats, door knockers, bedposts, and all manner of household decor: the pineapple. That exotic fruit, said Manegold, is as intertwined with slavery as the Confederate flag: When New England ships came to port, captains would impale pineapples on a fence post, a sign to everyone that they were home and open for business, bearing the bounty of slave labor and sometimes slaves themselves. “It’s a symbol everyone knows the benign version of — the happy story that pineapples signify hospitality and welcome,” said Manegold, whose book centers on five generations of slaveholders tied to one Colonial era estate, the Royall House and Slave Quarters in Medford, Mass., now a museum. The house features two carved pineapples at its gateposts. Thanks for sharing this, Clara. Interesting article. Can you tell me where the information about renting pineapples comes from? I have never heard of this before and would be interested in looking up the reference. In particular, I would like to see a colonial period source that refers to pineapples for rent, such as a baker’s advertisement in a newspaper, a trade card that advertises them for rent, or a period diary entry of someone renting one. There is a lot of misinformation about pineapples as a symbol of hospitality during the colonial period and you might want to take a look at the below references that talk about what the pineapple did and did not symbolize in Colonial America. Hi Chuck, I read about pineapple rental in several sources, the most legit of which might be an article on the Dumbarton Oaks Research Library website: http://www.doaks.org/library-archives/library/library-exhibitions/botany-of-empire/hothouses-and-pineapples. I also saw a reference to it on Durham Castle’s website, so apparently the practice occurred in Europe as well: https://www.durhamworldheritagesite.com/architecture/castle/intro/black-staircase/pineapples. I’m afraid I don’t know of any primary sources. Thanks for the links about hospitality symbolism. Interesting! It did seem to me that many sources were vague about when pineapples became a symbol of welcome as opposed to just status, but I assumed that this was because it was a slow evolution. Some of the online sources I consulted were Hoag Levins’s Social History of the Pineapple”(http://www.levins.com/pineapple.html) and the University of Central Florida Libraries, which held an exhibit about the subject and maintains that the symbolism was in place by the 18th and 19th centuries. (http://library.ucf.edu/rosen/pineapple.php) Hmm… There is a dissertation in this topic for someone. A favorite recipe at our house. I use the Cook’s Illustrated recipe, which includes 3 tbsp cornmeal for a crunchier/grittier texture. Although that fluffy cake also looks divine! I would not waste a fresh pineapple on this cake — as noted canned is guaranteed sweet and you don’t have to worry about the fresh fruit cooking thoroughly. That’s a good point about the fruit cooking through. I would love to try the Cook’s Illustrated recipe sometime. Time to resume that subscription, I think! I hope you’ll try my invention–apple-molasses upside down cake. As I explain at Ancestors in Aprons, http://ancestorsinaprons.com/2015/02/molasses-apple-upside-down-cake/, I had some apples around that were threatening to go bad, and my great-grandmothers would not have put up with that! So I used their favorite sweetener, molasses and made an upside down cake. I did, however cheat on the cake and used a boxed cake mix. My great-grandmothers took full advantage of innovations in the kitchen, so I don’t think they’d mind, since the boxed spice cake is really good. My ancestors would not stand for throwing out food, either. Your cake looks wonderful — thanks for the link! It is really good. I made it for a school project for social studies and they loved it. Thank you for making this recipe. Glad this came out well for you!